On each Arbor Day, the Pass Christian Garden Club performs an observance by way of a "Planting" ceremony, or as in 1990 and '91, a Tree Tour. Such ventures have continued to qualify the city for Tree City USA recognition. To receive this national acknowledgment, a city must meet four standards: a Tree Board, a Tree ordinance, a comprehensive community Forestry Program and an Arbor Day Observance. Ms. Shirley Doe was very active with the Garden Club and the Tree Board in rewriting the City Ordinance, the Tree Commission by-laws and the 1991 Tour of Trees. Coral Trepagnier was also quite involved in leading a group to measure trees over 100 years old. They were able to register more than 100 such majestic oaks in the Pass excluding the older trees which were already registered. The Pass Christian Tree Ordinance was originally passed in 1979. It regulates the removal, cutting, or damaging of Live Oak trees and Magnolia trees. The Ordinance controls such trees measuring a minimum of 18 inches in diameter or having a circumference of 57 inches at the height of 36 inches above ground. Penalties for non-compliance is a $500 fine — and/or 30 days in jail. Each time a tree is removed in the Pass, it must be replaced with the same type of tree. Shirley Doe explained that Live Oaks grow rather fast when they are young but growth is slow as they age. In determining the age of Live Oaks, bore samplings do not render the needed accuracy. Instead, the tree must be measured for its circumference at between four to four and a half feet above ground level. That circumference measurement applied to a formula renders the age. 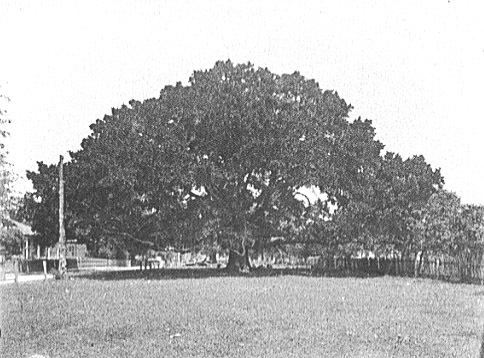 The largest Pass Christian Live Oak tree was situated behind the house now located at 516 E. 2nd Street at Lang Avenue. Unfortunately, it died of old age about 50 years ago. It was known as the King of Oaks in the South, even larger than the great Friendship Tree in Long Beach. The Majestic Giants listed below have all been registered. Those with age listings were included in the 1991 Tour of Trees. The 13 trees along the walkway behind the Gazebo in War Memorial Park are named – but the plan to place tree plaques at each Live Oak never materialized, therefore no one knows which one is George and which one is Betsy, or Abraham, or . 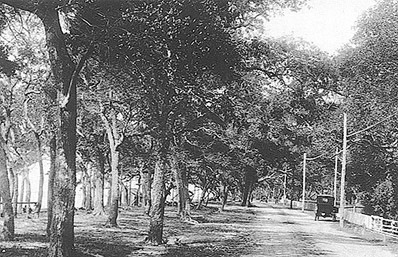 . .
A 1915 photo of Beach Boulevard Pass Christian's shell road and trees. The Mammoth Oak at Second and Seal streets. 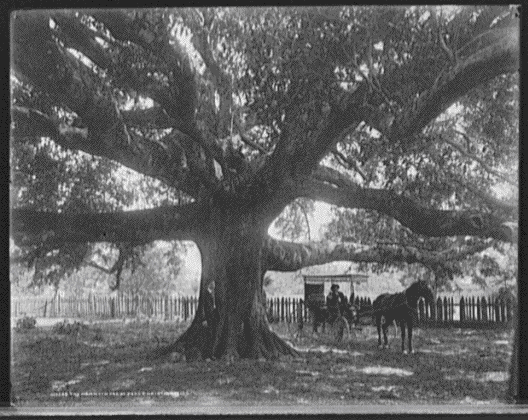 The same Mammoth Oak showing its gerth with a man standing at its trunk and a rented horse and carriage taking shade. 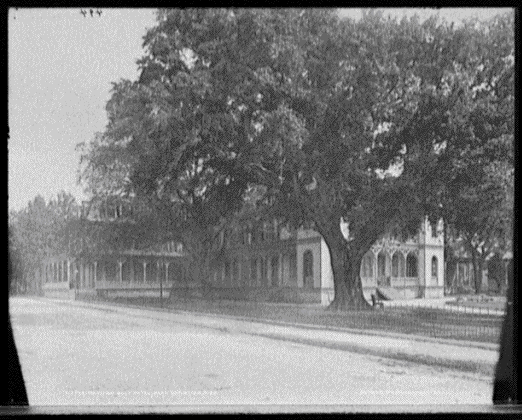 The above large oak was cut down after the Mexican Gulf Hotel burned down in 1917 to provide commercial space at the corner of Davis and Beach Ave.